This year’s ESRC Festival of Social Science took place form 7-14 November with over 200 events across the UK. It is aimed at sharing the work of social scientists with the wider public and offering insights into how social science research impacts on our daily lives. The University Living Lab took this opportunity to explore the Living Lab approach and its role in collaborative research. 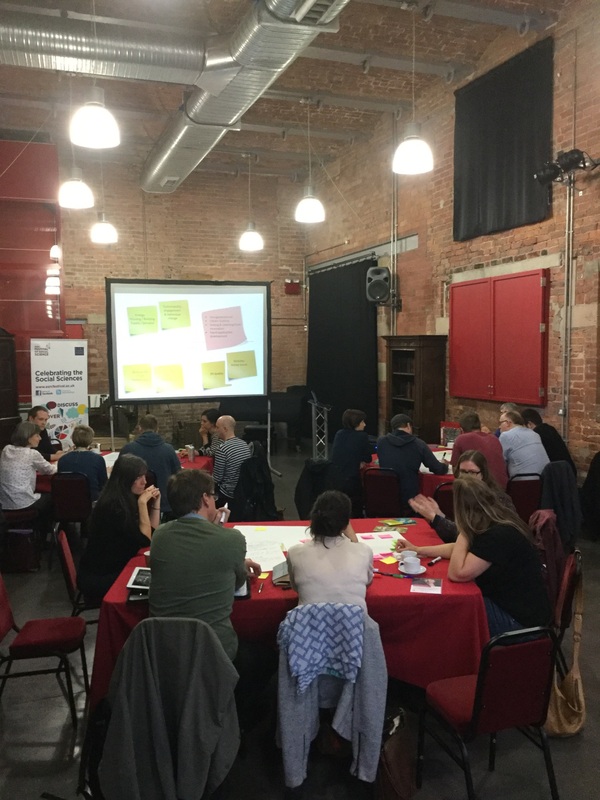 The workshop “The University Living Lab & Collaborative Research”, organised by Jana Wendler and Gabriele Schliwa and hosted at the Anthony Burgess Foundation on 10th November 2015, brought together over twenty participants from across Greater Manchester, including local authorities, film makers, campaigners and universities. It aimed at both reflecting upon the process of collaborative research and creating pathways for new projects and connections. The event was kicked off by Andy Karvonen who introduced the audience to the Living Lab approach as well as the University Living Lab initiative on campus. Founded in 2012 with a focus on environmental sustainability, the University Living Lab provides a platform for innovative campus development and applied research that crosses academic and non-academic fields. To date, its searchable database and active networking has supported over 96 sustainability projects. The team presented snapshots of several collaborative projects: the i-trees project, the Ferranti Building PV System as well as the Nature Discovery Garden. Gabriele Schliwa then shared more in-depth insights from the Manchester Cycling Lab . The ESRC Impact Acceleration Account funded project started as a cycling research programme between the School of Environment, Education and Development (SEED) and Manchester City Council in 2014, and still continued to establish cross-sector partnerships that support cycling projects in Greater Manchester and beyond. The second part of the event consisted of an idea and project mapping exercise designed to explore common interests, specific areas for collaboration and required favourable conditions. This gave everyone the opportunity to share their experience in collaborative research and engage in discussions how to advance opportunities and deal with challenges. The discussion concluded with lively networking around a range of shared sustainability interests among the attendees, including sustainable transport, energy, biodiversity and green economy. The overall resonance from the workshop was very positive, with participants forming new connections and developing ideas that will be taken forward. It also provided a unique space for reflection amongst a diverse group of actors, which time constraints and other pressures often make hard to achieve. This emphasises the role of events like the Festival, which opens up research beyond its typical audiences and processes towards mutual understanding and synergies.